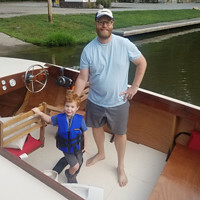 Looking to build a 16' standard/high sides drift boat. Being that it's my first build, I was hoping to get a ballpark figure on costs/material. Obviously cost for wood and whatnot varies from location to location, I just want to know how much it cost for other people who have built these before, if you don't mind sharing such information of course. I have not built one but just looking at dimensions it looks like you'd need maybe 7 sheets of plywood. There's minimal framework. I'm thinking you would probably spend around $3000. I could be off. This is just a guess based on how much I spent on some of the materials. There doesn't appear to be a bill of materials since there are so many size options, but maybe it's hidden somewhere. Those are really cool boats. Hope you decide to take the plunge. I want to construct a similar boat. Maybe the plan can be found anywhere? Or any other materials? i AM BUILDING A 16' WILD BOTTOM STANDARD SIDES. They recommend 18' long sides which is 5 sheets and the wide bottom is 4 sheets. Your sheers and chines are 16' and 19'. Get use to scarthing.